University of Southampton music students are leading an unusual project to show children in several of the city’s schools how the sound of a symphony orchestra is created. 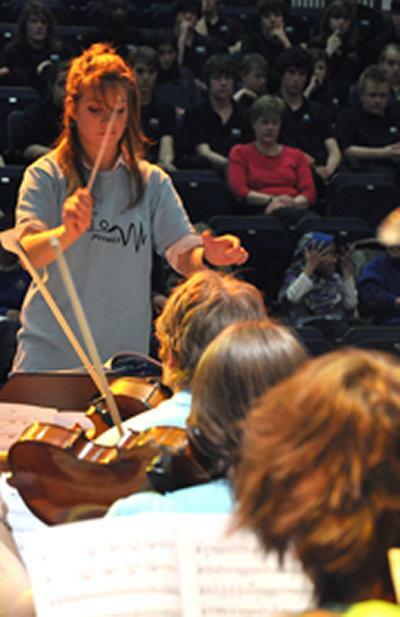 “Even children who don’t have an obvious interest in classical music will have heard an orchestra before – on film soundtracks, adverts and even computer games,” says President of the Southampton University Symphony Orchestra (SUSO), Kat Hattersley. Members of SUSO, supported by staff at the University’s Music Department and the Turner Sims concert hall, will perform live music at three schools in Southampton to around 400 pupils drawn from schools across the city. The concerts will be held at Portswood Primary School, Bitterne Park Secondary School and Cantell Maths and Computing College. Music students have already led school assemblies to explain what the project is about, discuss music with the children and even give them the chance to learn the basics of conducting. “We are expecting the repertoire to be quite varied. Southampton composition students are lined up to arrange music specially. The important aspect is for the children to see the musicians working together and to experience a big orchestral sound,” comments Head of Music, Dr Andrew Pinnock. The ‘Baby SUSO’ project is funded by the Higher Education Funding Council for England (HEFCE) and Southampton University Student Union Community Volunteering Projects Fund. It is part of the ‘Creative Campus Initiative’ which supports the London Olympic Games 2012 ‘Cultural Olympiad’. One of the pieces SUSO will perform is by composition Masters student Robin Langdon and based around the theme of the Games and sporting achievement.